The highlights of the collection are now on display in the new Rosicrucian Alchemy Exhibit, located in the Rosicrucian Egyptian Museum. 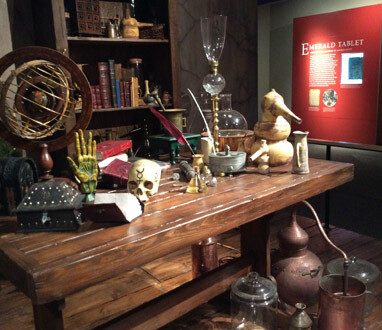 This new exhibit (curated by Dennis Hauck) features a journey through the seven stages of the Alchemical process, a meditation chamber, and a full-size reproduction of an Alchemist’s workshop. Join Dennis Hauck, Ph.D., Curator of the Alchemy Exhibit, as he guides you through this exhibit. Explore 3D models of some of the artifacts in the Rosicrucian Alchemy Exhibit.